Can you draw a story? That’s what comics are – stories on paper, said Marc Fishman one of three artists who create a series of superheroes for their Unshaven Comics studio. 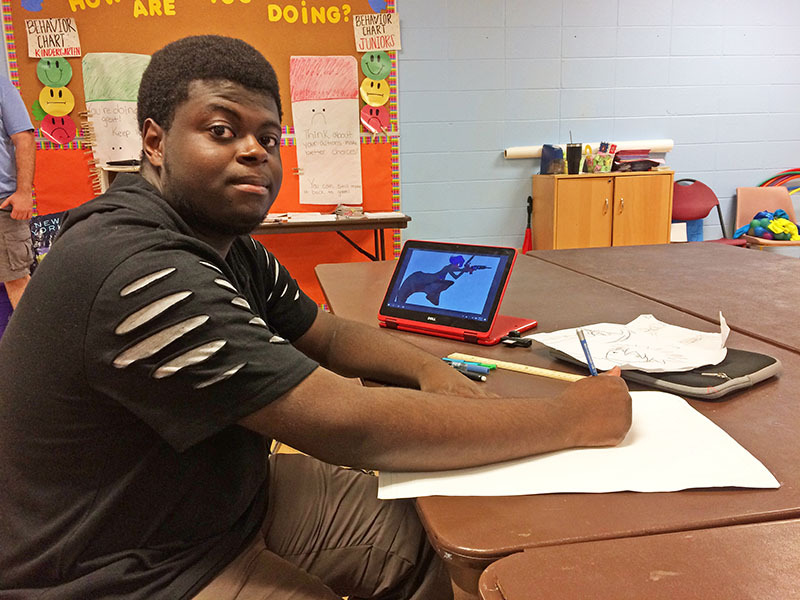 He and fellow Unshaven Comics artist Matt Wright are sharing their expertise in the Homewood-Flossmoor Park District’s “Comic Books 101” class starting Dec. 8. 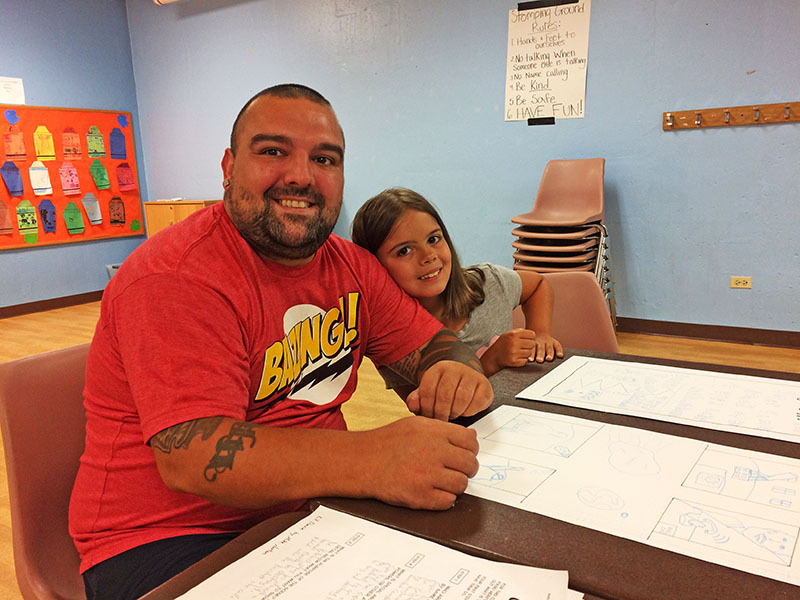 Ava Luiz, a third-grader at Churchill School, came to the summer class ready to draw her story about a family of superheroes. The daughter, Wolf Girl, was fighting the enemy. The eight-year-old was in the class with her dad, Robert, who also likes to draw. Fishman said cartoons can be simple, like the newspaper style strips that are two or three panels of art with a message, or they can be comics like Ava’s. Some class members come in ready to design a book like Marvel Comics’ Spiderman series. Fishman and Wright don’t want to discourage anyone from their great ideas. Together they teach the basics so young artists have a better concept of what it takes to be a cartoonist. “Our goal is to have one page (at the end of the class) that you’ve toiled on for awhile,” Fishman tells the students. The class opens with students working on an outline. Fishman gets them to answer basic questions: What do you want to draw? Do the characters have special powers? What makes them different? What is the theme -- a joke, a fight? From there, he and Wright help the kids develop the scene and plot out the action deciding how many panels they’ll need. “The younger kids, sometimes they’re overwhelmed so we start smaller, but they want the epics,” Wright said. The two artists ask the kids to think about what their characters look like 360-degrees. When its time to put pencil to paper, Fishman and Wright explain special artist blue-line graphing paper that can help with dimensions. From the pencil drawing, the character needs to be outlined and shaded or colored. The artists also need to think about how the dialog will be presented and in what type. The pair can teach to any level. Classes meet Saturdays, Dec. 8 through Jan. 19, at the Irwin Community Center, 18120 Highland Ave. in Homewood. 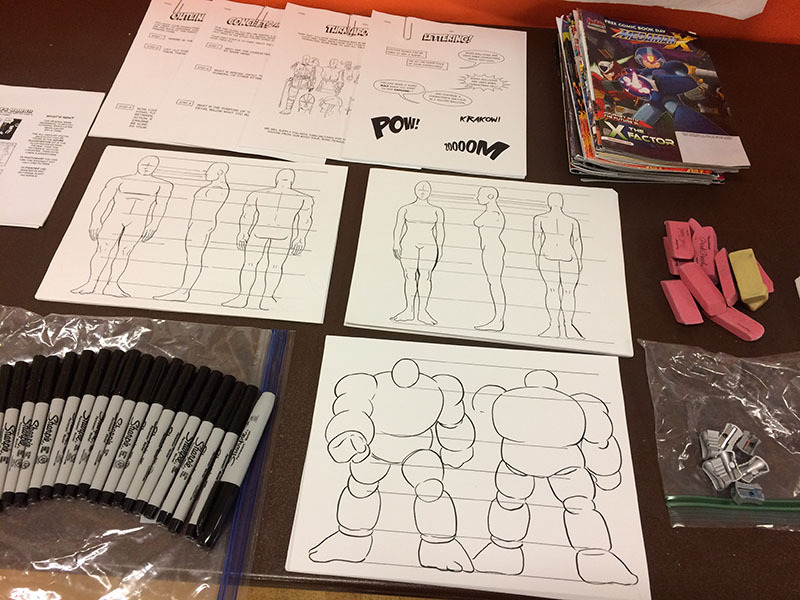 The first class for 7- to 9-year-olds meets 9:30 to 10:30 a.m.; the second class, for students 10 and older, meets from 10:45 to 11:45 a.m.
Kevin Watson of Chicago Heights said he’s passionate about drawing and making comics and animation. He came to the summer class with a story plot of two heroes in a forest who are overtaken by two villains who they fight off. “It’s a lot of (drawing) practice, and they introduced me to the whole (comics creation) process. Before this class I didn’t even know about the paper with the blue lines and what they meant,” the Homewood-Flossmoor High School senior said.